Note to self: don’t drag your husband + kids out to take quilt pictures on an extra windy day. It will make everybody cranky and then you’ll have to buy them all donuts to make them happy again. It’s much easier to take pictures inside. I loosely picked the colors for this quilt from that Denyse Schmidt polka dot. After many quilts in these colors I’ve yet to tire of this combo. A pattern for this quilt in multiple sizes can be found here. LOL!!! Now I'm wishing I hadn't deleted all my windy-day quilt pics from last week. Gusts of up to 20 mph. To say the least I waited a day for some do-overs. Beautiful quilt – love your colors! It's a beautiful combo. No wonder you never tire of it! I love the color combo….beautiful quilt! Oh, this is soooo beautiful! But I do like your picture in the wind! So pretty! I love plus quilts, and I can't wait to use my stash of Sherbet Pips to make one! Thanks for sharing this! Love the colour combination. It looks so fresh. 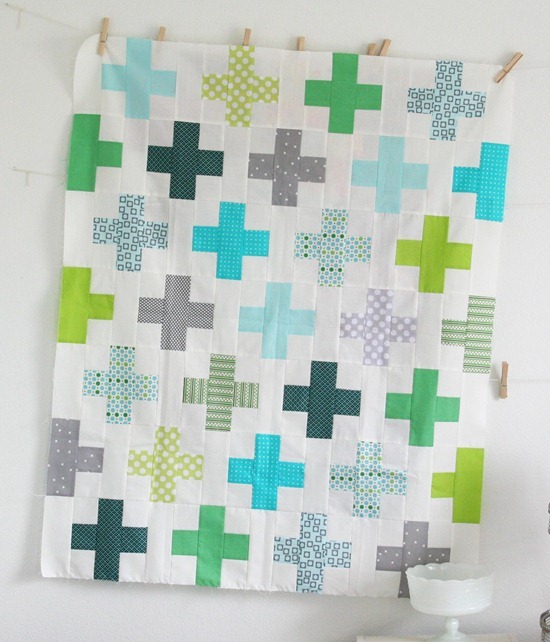 Such a pretty quilt…adding the three dark green crosses was key, I'd say! Love it!! Love this!! My poor family is so sick of me taking pictures of quilts. (And my backyard neighbors think I'm crazy). I need to try more donuts. Love the white with the green and blues! I always have to bribe my siblings to do quilt holding. "If you hold this up I'll give you bubblegum!" In the wind or on the wall, your quilt top looks just fab either way!! I love the colours you've chosen! It looks so fresh against the white. Very pretty!! :) I love the colors too! It really is a lovely quilt! So pleasing. I love hearing which print was your initial inspiration (especially since I have that same print). Sounds like an adventure for all! Absolutely stunning! I love both the colors and the pattern. I just love your style!! Your blog makes me happy! I learn a lot about color from reading your blog. Love this quilt! I never tire of your color combo's they are so refreshing. Ah,yes, quilt wind. Although my hubby whines when he has to help me take pictures of quilts even when it's not windy. Sheesh. What I need is a maid servant! Can't wait to see how you quilt it (stippled..? hehe). We know our families love us when they help us with things like quilting. Beautiful! I am not a quilter, but your pictures are very inspiring! love your color choices- i already want to make one! Love those colors! And with white…gorgeous. It's a beautiful combination of fabrics, fresh and cool. I love the windy shot, but also the indoor shot hanging from the clothespins. Love the quilt! The colors are perfect combo and it reminds me of the seashore. I thought I was going to be original and tell you I love your colour combination. No wonder you want to keep using it. Oh well, it's obviously true. You use a lot of white. Do you buy it by the bolt? What kind of white fabric do you use? Love that colour combo too! Working on one in that colourway myself. It's gorgeous! Your color selection is spot on! I love the inspiration quilt, too. Where can I find this pattern? I love it! !